I'm sure you've all heard of Everyday Minerals if not then quick pop on over and check out their beautiful blushes and eye shadows! They are also very popular for their foundations and other product ranges. They are based in America and ship internationally.. yipee for us!! I was lucky enough to recieve 3 mineral blushes and one mineral eye shadow roller ball. They are very pigmented and the colours are fab, the photos do not do them justice! They have a handy non-spill section which is great! I just tap a little product out into the lid and apply with my Mac 168. However would love to try their brushes. 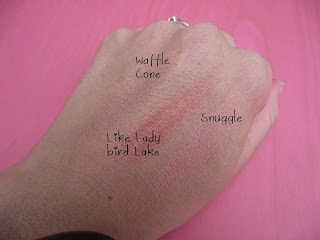 Here is a photo showing me with Waffle cone (a light peach matte with a hint of pink and soft sheen) on the cheeks and Ginger Peach (a light tan/pale peach shimmer) on my lids. 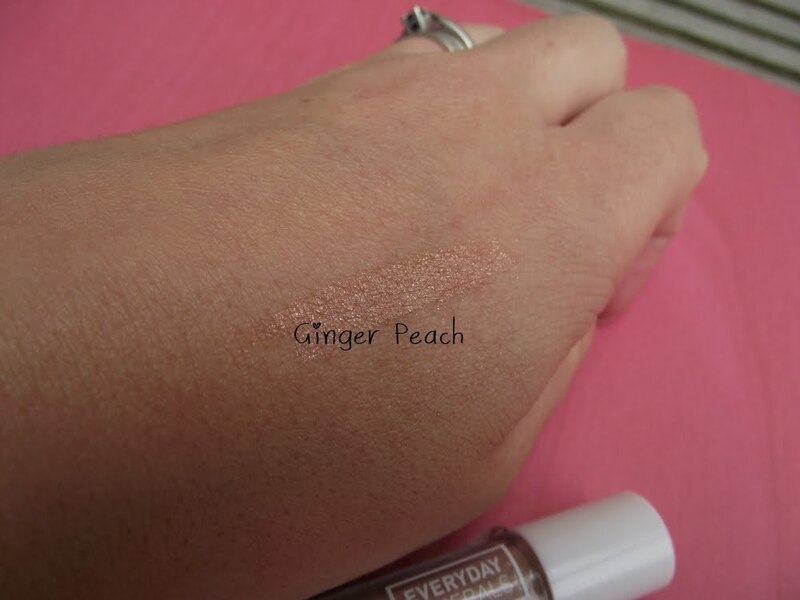 Here is me wearing Like Lady Bird Lake (a true peach with a hint of pink sheen) and Ginger Peach on the lids again, I love love LOVE this roller ball shadow!! And lastly here is me wearing Snuggle (A radiant pink with a hint of peach and a soft sheen) with Ginger Peach on the lids with a brown khol on the lash line. They are all beautiful colours and I enjoy wearing them everyday, they have heaps more shades on their lovely website so have a nosey :) they offer FREE mini kits with every order! The eyeshadows are $6.50 and travel size which I have $4.50. I so recommend these for everyone!! Being a busy mummy to 2 little ones this really has helped me cut down the amount of time I spend in the morning, I use this so easily and quickly and yet the results look like I've spent ages infront of a mirror! I love using this all over the lid and then use a charcoal shadow softly in the outercorner for a soft smokey look! This is my fav look. I would love to try more of the roller ball eyeshadows in a few different colours and also one of their foundations. I like the sound of their 'Original Glo' foundations and also their brushes look such amazing quality, has anyone tried them? Have you tried any Everyday Minerals products? I haven't tried any - but how lovely do you look wearing them - the blushes look lovely, and what a great idea rollerball eye shadows! your skin looks so flawless here! There must be some sort of secret for the rollers. I got three, 1 concealer and 2 eye shadows. It's impossible to do detail work with them. The shadows don't roll on smoothly and you end up with large smudges of color that you then have to smush around more than is ok for the delicate skin on your eyes. How are you managing to get the rollers to look ok?